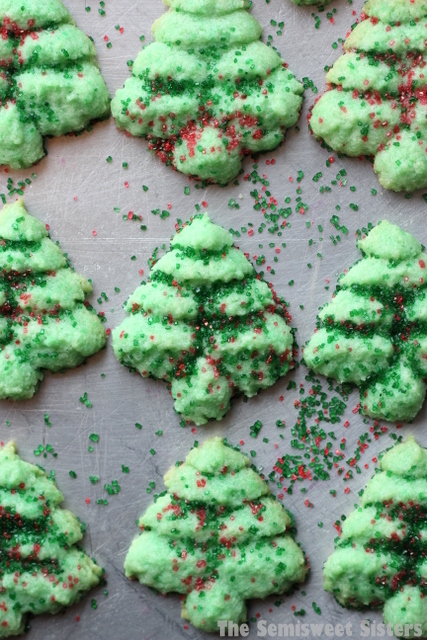 Buttery, Sugary Christmas Tree Spritz Cookies! These are my favorite Christmas Cookies! Every Christmas Eve we make these Christmas Cookies. When I was young I used to make them in the afternoon then take them over to my Grandma’s house because it was a family tradition to spend Christmas Eve there. Then of course we would leave some of these cookies out for Santa when we got home later that night. It’s funny my Dad never did a lot of baking but for some reason he’s the one that taught me how to make these. I was probably 8 or 9 years old when he first taught me how to make them. As a matter of fact my 8 year old niece made this batch with me, she had a lot of fun learning how to make them. When we were halfway through I asked her if she wanted me finish making the rest & she quickly replied with a “No”. So she made all of them & I think she did a great job with them! These cookies are simple to make. 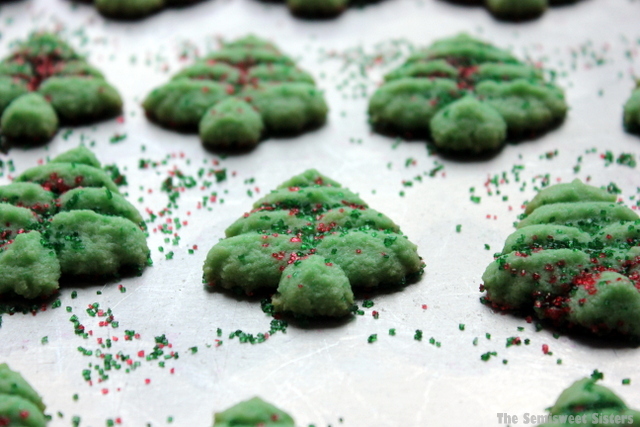 You will need a cookie press to make them & the tree pattern disc. Be careful that you push out enough dough for each tree or it will not stick to the cookie sheet like it should. If the dough is giving you problems you could try chilling it for 20 minutes or so in the refrigerator. I never have any trouble with mine coming out nicely but I know some people do. A whole batch makes about 4 cookie sheets worth of cookies depending on how big of trees you make. I forgot to count how many it made but it makes a lot! If your looking for a cookie press Amazon has the Oxo Good Grips Cookie Press & the Wilton Cookie Press both come with a tree pattern disc. Mix butter & sugar together. Stir in egg, vanilla, & almond extract (optional). Add flour, salt, & baking powder & mix well. Add a few drops of green food coloring & mix in. Scoop dough into cookie press fitted with tree pattern disc. Press cookies onto ungreased cookie sheet. Bake at 375 degrees for 8-10 minutes. If you like your cookies soft then bake until cookies are set, if you want them crisper bake until edges are starting to brown. I love spritz cookies and I don’t make them often enough. Love the trees! 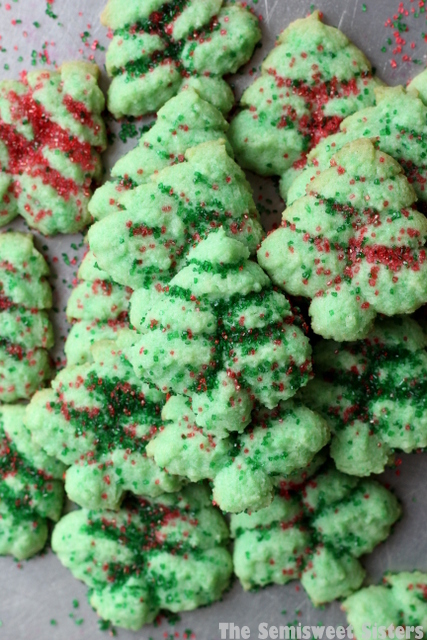 Where do I get a cookie press with a tree pattern disk? Hi, Almost every cookie press comes with the tree disk. Amazon has several brands to choose from like this one: http://amzn.to/1HgreLV & http://amzn.to/1Hgriet . Places like Walmart carry them & craft stores. Target has one on their site that you can order for pickup at your local store too. I’ve had issues with my spritz cookies spreading? Slightly different recipe. Any thoughts? Hi Tammy, hmm I’ve never had an issue with spritz spreading…maybe adding extra flour would help. If I’m making regular cookies & mine spread they usually need more flour. Good luck! Using margarine instead of real butter will make cookies spread. I wonder if that is the “slight difference “? Hi Phaedra, I have never used anything but butter for this recipe. If your using oil or margarine it may help to refrigerate the dough to prevent spreading. Have you ever made these and then froze them? Im wondering if its something I could make a head. I wasn’t sure how they would turn out once they were thawed. Hi Amber, I have made these ahead of time and frozen them for a few days & they were fine. I just wouldn’t freeze them for too long or they might get freezer burned. I have made these cookies for years! I put all ingredients together in a food processor and pulse until it all rolls together. Just cut the cold butter in several smaller pieces and check that it all blends in. Voila! Into the cookie press, decorate and bake. Enjoy! I’ve never tried using a food processor, thanks for sharing!